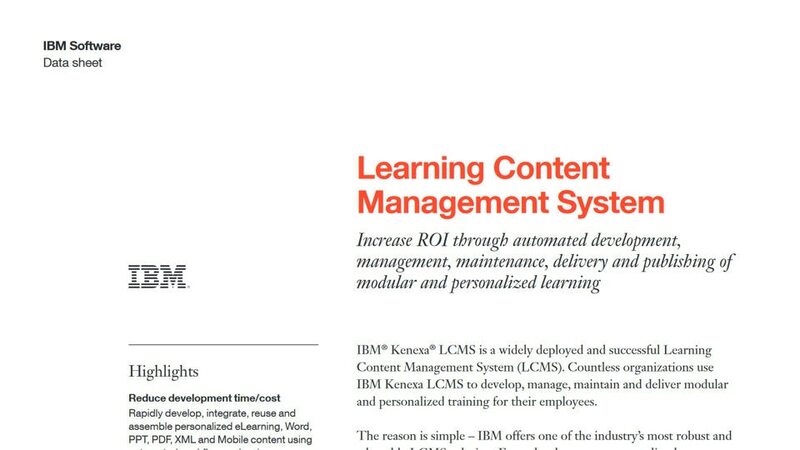 IBM® Kenexa® Learning Content Management System (LCMS) is a full-featured LCMS that centralizes and automates learning content development, delivery, management and maintenance. Rapidly develop, integrate, reuse and assemble personalized eLearning, Microsoft Word, Microsoft PowerPoint, PDF, XML and mobile content using automated workflows and reviews. Quickly find assets, perform impact analysis, modify content and automatically propagate changes. Foster collaboration by supporting social interactions and enable employees to keep current with required competencies and help meet compliance demands. Adopt single-source content management that provides personalization, prescriptive learning, performance support, video learning and social collaboration. Author content once and reuse—even with non-IBM Kenexa systems—to make the most of your learning content development and distribution. Take advantage of a tested learning and development platform to help your teams meet business goals and bring innovative new product offerings and services to market.